This is a love triangle like no other. A battle between heart and head that will tear your heart in two. While Lisa Edward has called Melbourne Australia home for her entire life, she has lived and worked in England, and travelled through most parts of Europe and the United States. She loves nothing more than spending time with her beautiful daughter, or curling up into the early hours of the morning with a great novel. Her deep appreciation for literature was nurtured from a young age, being taught to respect books and get lost in their stories. She enjoys reading honest and realistic novels that are relatable, thought provoking and leave a lasting impression. She can't write without music playing, using the emotions from different songs to invoke that of her characters. Lisa takes inspiration from her own life experiences, the people around her and those she has met in her travels. All readers are forever in search of those illusive books that stay with them long after the last words are read. So you will understand me when I shout out "AMEN , HALLELUJAH SISTER , I HAVE FOUND ONE " !!! A. Corporal Riley Hammond who says sweet swoonworthy things like "Do you think I could add to your happiness Tara?" "He ran his thumb over my swollen lips, then touched his thumb to his own.I can taste you, he said, his voice so hoarse it was barely audible. He leaned down so close I could feel his breath on my cheek.And I can smell you." If these are the reasons that make Songbird into one of my favourite books containing some of my new all time favourite characters then I am going to have to say its due to all of the above choices that are brought together in an exceptionally well written book. I didn't just read this book, I LIVED it and FELT it. The raw emotion, the angst, the love and the times that we could see as readers that were yet to be identified by the characters. 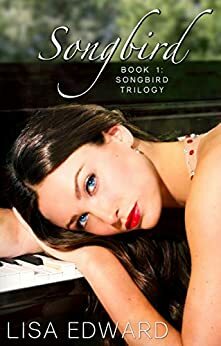 This is the first book in the Songbird trilogy, a debut novel by Lisa Edward.... not that you would know it as it was a polished and well thought out book. Was it a cliffhanger??? .... No , but I NEED to know what happens next! "A lot can happen in 6 months Tara. People can change, circumstances can change and you've committed to standing still"
4.0 out of 5 starsA great debut! reaching out after her bad experience. Cole on the other hand was to me the most interesting character and I hope I will see more of him in coming books. I think Songbird is a enjoyable debut and I will most definately buy the rest of the triology. 5.0 out of 5 starsLove Riley, Cole and Tara!!! This book was ah-mazing!! I didn't want to put it down. It was a long book, but didn't feel long. I am happy and sad that this book ended. Sad because I have to wait for book two and happy that I get more Tara, Riley and Cole. Tara is trying to find herself after a two year long relationship that didn't go well. She was always told she wasn't good enough. She needed to find herself and where she belonged in life. She was instantly attracted to Cole when she sees him. Though she doesn't know his name her and her best friend Kelli, called him Mr. Hotbod. She was embarrassed to talk with him after Kelli and her big mouth. She then meets Riley through Kelli and her boyfriend Cooper. She wants him and feels drawn to him, but doesn't know if she can handle a long distance relationship. She has issues with trust and doesn't think she can handle constantly wondering what is happening. Will she give Riley a chance? Or does she open up to Mr. Hotbod? Riley is content with his life. He doesn't need a girl since his girlfriend broke him. He is shocked by the connection he feels for Tara the moment he meets her. He doesn't want to push her because he feels she is special and wants a chance to get to know her. He knows it won't be easy having a long distance relationship, but knows it will be worth it. Can her convince her to give him a shot? Cole is a manwhore. Always with a different girl and never gives a girl a second time. He is happy the way his life is going. Until he meets Tara and she turns his life upside down. Making him want things he shouldn't. Will he have his chance at Tara? Or does his manwhore ways scare her off? This is an intense book. It had me on the edge of my seat hoping for things to happen or not to happen. I really LOVE Riley. He was so sweet and charming. Though he wasn't perfect, but who is? Now I had a lot of issues with Cole, but by the end of the book he had me rooting for him. I am so torn with who I want Tara to end up with. I think that I will always be Team Riley. I cannot wait for book two so I can see what happens between all these people. I loved all the secondary characters also. Jason, Marcus, Jay, Kelli and Cooper. I really would like to see a book on all of them. This is a definite MUST read book. I think Lisa Edwards did an amazing job drawing emotions out of me and making me feel like I was in the story.